Florida is one of the most unique states in all of America. Mostly made up of a peninsula that juts out between the Gulf of Mexico and Atlantic Ocean, Florida is the southernmost contiguous state and covers an area of 65,755 square miles, making it the 22nd largest state. Despite not being one of the largest states, it has the third highest population, trailing California and Texas. It has the longest coastline in the United States, is the only state to enjoy a tropical climate, and is famous all around the world for its unique attractions and touristic hotspots. Nicknamed The Sunshine State, Florida has the hottest weather of any state and is home to Disney World and Universal Studios theme parks, along with famous natural areas like the keys and Everglades, home to all sorts of unique wildlife including alligators, crocodiles, flamingos, panthers, dolphins, and manatees. The elevation of Florida is also a unique aspect of this state in that it is technically the flattest of all the states, with a relatively small difference between its highest and lowest points of elevation. It also has the lowest high point of any state. In terms of mean elevation, Florida is the third lowest state, with only Delaware and Louisiana being lower. Florida has a mean elevation of just 100 feet (30 m). Its highest point has an elevation of 345 feet (105 m), while its lowest point is the waters of the Atlantic Ocean and Gulf of Mexico, which are at sea level. The area with the highest elevation in all of Florida is Britton Hill. This hill is located in the northern part of Walton County, not far from the town of Lakewood. Britton Hill is in the Panhandle part of Florida, rather than the peninsula section, and can be found quite close to the state border with Alabama. Britton Hill has an elevation of 345 feet (105 m). In order to commemorate Britton Hill's status as the highest point in Florida, a little park is located on the top of the hill and a marker sits at its peak. As previously mentioned, despite being the point with the highest elevation in all of Florida, Britton Hill is the lowest highest point of any state. The highest town in Florida is Lakewood, which is located on the border that separates the state of Florida with the state of Alabama, and isn't far away from Britton Hill, the state’s highest point. Lakewood has an elevation just a little lower than the 345 feet (105 m) of Britton Hill. Despite technically being a Floridian town, Lakewood is quite different in terms of scenery compared to the typical Florida location due to its proximity to Alabama and its distance from the main peninsula. Due to the fact that Florida has such a long coastline and is such a flat state in general, it can't boast the same high elevation places as states like Colorado or Utah. It doesn't have any mountain ranges or similar areas, so all of its highest points are just hills. Many people all around the world live in cities that are situated at elevations of 500 feet (152 m) or less, and the entire state of Florida is within this range, but it does have a few relatively high points. Three of the highest points in the state of Florida after Britton Hill are Oak Hill, High Hill, and Falling Waters Hill. All three of these hills are found very near to each other, in Washington County, which is located in the Panhandle region of Florida, not too far away from Britton Hill in Walton County. Oak Hill has an elevation of 331 feet (101 m), High Hill has an elevation of 323 feet (98 m), and Falling Waters Hill has an elevation of 318 feet (97 m). 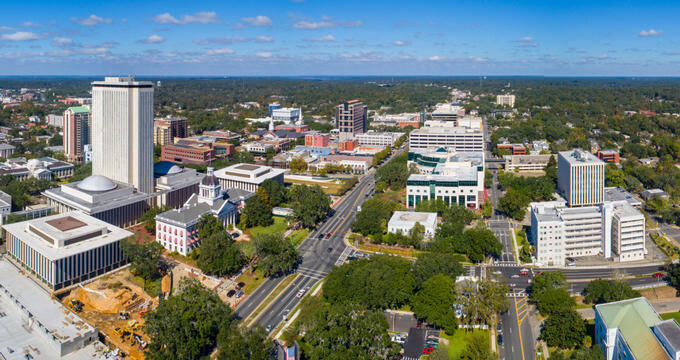 The state's capital, Tallahassee, has an elevation of 203 feet (62 m), while Orlando, one of the Sunshine State's most famous cities, has an elevation of 82 feet (25 m). Another key location in Florida is Sugarloaf Mountain. This is technically the fifth highest point in the state, standing at an elevation of 312 feet (95 m), but is actually the most prominent point in the state due to the low-lying land that surrounds it. This has led many people to erroneously believe that Sugarloaf Mountain is the highest point of Florida, but Britton Hill technically has the highest elevation.